The Magic Behind The App...How we bring All VIP Access to you! The Las Vegas Strip right to your Phone! Nightclubs to Limos, Concierge to Party Packages! The number 4 is very popular in the Vegaster world. After many years & endless trips to Vegas we knew things could be better! We can change our homes AC temperature from a phone, order food to be delivered, even track where your friends & family are, so why is Vegas different? It was....until now! We have put the latest in phone technology, matched up with the Vegas VIP experiences all together. You know the saying, it's all about who you know. We have partnered up with the biggest, baddest, most experienced Las Vegas Host, Clubs, Tours, Restaurants & everyone in between to bring something never before seen. Vegas, in the palm of your hand! Your parents used a map book, we use our GPS mapping right in our phones! Travel agent? They are perfect source to get you to and from and where you should stay, but what about when you land in Vegas? Who do you turn to for that last minute activity? Call information for a phone number? Is that even real? Google it! We have spent many late nights working our contacts at top venues to give you the best time Vegas has to offer! Unless you have some crazy inheritance, you are looking for great deals just like us. When someone tells me its going to cost $2000 for a VIP Bottle Service Table, I know there is a better deal out there! We cut out the middle man to save you time & money! Of course the hotel door guy wants you to take a taxi 1 block. We tell you like it is. Walk, it's 3 minutes away and a great bar on the route! Wandering the strip has never been better with the leaders in experiences! Never back track because you don't know where the closest ATM is. Never leave the table when you're on a run because you forgot your belt at home. Vegaster brings you Real Time Deals & Offers at Top Rated Venues across the strip. Vegaster Ground Support keeps you from doing those dreaded vacation things. Shopping for a Shirt, looking for real toothpaste, anything you forgot to bring, we can bring to you. You need it, we can get it. We have all had "those nights" when you can't remember a thing! Like, what room number am I again? We do! Calendar, Reminders, Reservations, Ground Support (aka Concierge), and a Vegas trip like you have never experienced before! Vegaster VIP Technology was built for people just like us. We know that nothing is better the next morning than a bottle of water, an energy drink and the day ahead! Looking for a hookup? Searching Facebook & Twitter for a guy? Do you really try that Card Flipper for "Free VIP Passes"? 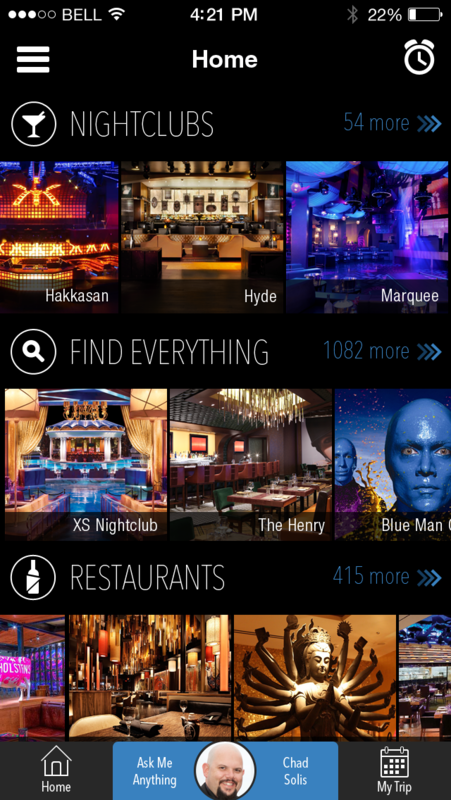 With Vegaster, we give you DIRECT ACCESS to Hosts at the TOP Clubs on the Strip! Need a Table, no problem. With "Direct Reserve Technology" you and your crew will be in the club and popping bottle faster than ever before! Balla on a budget? We got your back. "Price Your Party" allows you to tell the host across the strip what your budget is and get DIRECT responses so you know what you're paying the moment you walk in! Vegaster "All Sync'd" Technology lets the leader of the pack keep the team on track! Just have your friends download the app and enter in your personal code, to get everyone "All Sync'd"! Everyone sees the same Reservations, Reminders, Alerts and Offers! Never have that one person in the group tell you, "I didn't know dinner was at 8"! All Sync'd is the way to streamline your Vegas! We have all heard the saying "The More You Know". Guess what, we know a lot! With our Vegaster Trending Hot Spots you can enjoy the very best. That great Local Bar, or the quickest way to the next adventure are available in real time. Users like yourself help us continuously adjust, break, move and perfect the ultimate Vegas Experience. Today's Top Hot Spot might be tomorrows forgotten land. Don't get caught wasting time, effort and money on a last summers fad! You might wear socks with your sandals, but know this, we would tell you it's not cool! Just because some random person in your Hotel said this is a great bar doesn't mean it is. We use Feedback, Ground Support, Lack of Sleep and our Livers to make sure every stone is turned. Every Vegaster Trending Hot Spot has been personally selected by you....The Vegaster Calvary!